Freya finally got her wish for a chocolate dessert last night with these Ultra Choc Brownies – from – you guessed it – Hugh Fearnley Whittingstall’s River Cottage Light and Easy cookbook. There have been two slabs of dark chocolate floating around the back of the fridge for over a month since my failed attempt to get my daughter Olivia to make cookies with me. I seem to recall I made them while she watched TV (or played with the iPad – I can’t remember) and then Freya and I ate all of them because she forgot to take them home with her. 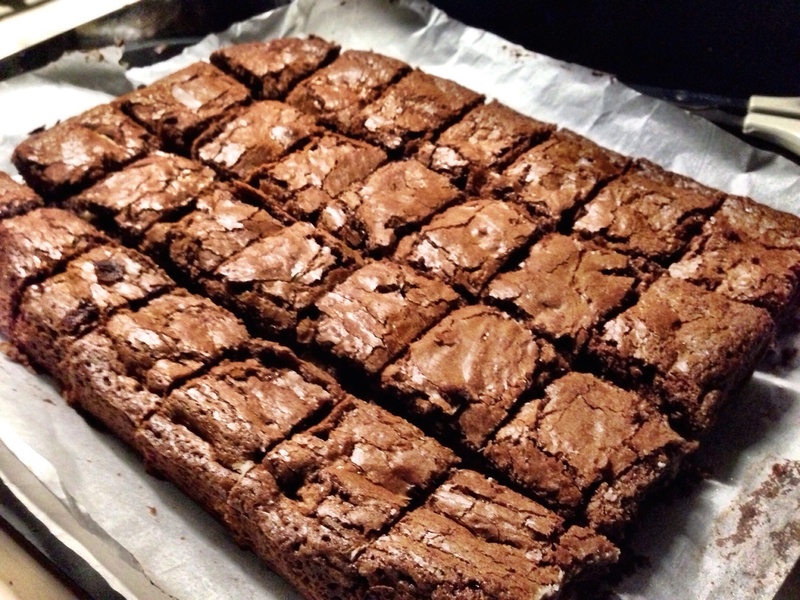 Anyway – rather than have this chocolate gradually disappear square by square (not unlike the bag of marshmallows that seemed to suggest we either had mice or secret marshmallow stealer) – I figured I’d use it to make these brownies. The recipe calls for chocolate with at least 70% cocoa solids. Mine only had 60% but it didn’t seem to matter. It also called for coconut oil – which you won’t find everywhere. Morrisons didn’t have it – they didn’t even know what I was on about! I ended up getting mine from the small Turkish supermarket on Brentford High St. I bought a few bottles as I figured I might make these again! To make these you melt the chocolate and coconut oil over a bowl of water (they way you’re supposed to) and let it cool down to barely warm. While that’s cooling whisk a couple of eggs with light brown sugared some vanilla extract. I didn’t have any so I split a vanilla bean I found in that back of the cupboard! Then sift some ground almonds, rice flour and baking powder. Add the egg mix, and the chocolate mix and fold it all together. Finally add some chopped walnuts. You end up with a thick batter which should pour easily into a baking tin. It’s a good idea to line the tin with parchment or you’ll never get the brownie out! Since we moved onto the boat, we found a leak on one of the roofs so we used our silicon baking tin as a ‘stopper’ and it’s been out there for over 6 months. Suffice to say we didn’t use it – we bought another one! Bake the mixture until a skewer comes out clean – then take out of the oven and leave to cool in the tray. Let it go cold in fact or it will probably fall to pieces as it is quite fragile. While it was cooling we watched Guardians of the Galaxy. Far better than The Maze Runner – and full of that Marvel humour that I love. If you want to see how far CGI has come on over the years – and how it is put to good use – this is the film for you! By the end of the film the brownie was cool enough to eat! So I cubed it and we had a few squares. Well – you’re never sure with just one piece are you! They are fairly gooey on the inner squares – fairly crumby on the outer squares. One things for sure – they are very chocolatey. The nuts add a very nice texture too! According to the book if you leave them in the fridge they will get fudgey. I shall be finding this out today! UPDATE: They very much do become more fudgey after a day in the fridge. Must be the coconut oil. So – make them – and be patient – they will be so much better this way!